Every Centralpoint module is built considerate of this Multiple Polyheirarchical Classification, which gives you a world-class platform that is capable of Scalability and growth. Centralpoint’s unique MphC architecture empowers you with Shared Services. Centralpoint is offered in a number of license options that include a Single Site License, Enterprise Portal License, and a Master Enterprise License for unlimited use of Centralpoint. Oxcyon’s content management solution is designed for a number of industry verticals including publishers, hospitals and healthcare, government, eCommerce, Non Profit Organizations, Media, manufacturers, advertising agencies, PR firms, GIS, Online education and more. Centralpoint is a leading Digital Experience Platform used by hundreds of organizations in a myriad of verticals. It enables organizations to author and manage content, allows each user access via single sign on, and the information can be served to each constituent audience from a singular, central point. The platform’s integration with Active Directory, LDAP, oAuth, Salesforce and other tools allow for secure authentication of any user including employee, client, partner and affiliate. Centralpoint considers all of information types including documents, webpages, mobile and design so that each user is provided with a unique online digital experience. Centralpoint streamlines all digital strategies by giving users one place to manage information, which cascades down to the users who need it within the organization. Centralpoint goes beyond being an omnichannel communication platform and works to push information to each user based on their audience and role. The software collects and harvests user activity resulting in rich Business Intelligence, gamification, and reporting. Centralpoint provides out-of-the-box tools for integration with many back office systems to facilitate harmonization with third-party platforms already in use. Oxcyon has enjoyed early market adoption in Healthcare, Media, Manufacturing, Government, Non Profits and Publishing. 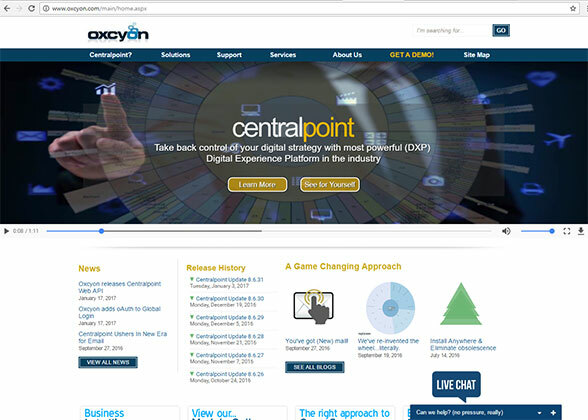 Oxcyon is the developer of Centralpoint, an innovative content strategy that extends beyond the typical boundaries of a content management system. The company was founded in 2000 and brands itself as a visionary software provider known for its comprehensive web strategy. Centralpoint has been rated a Top 10 CMS software product for 3 years running. Say hello to the 800lb Gorilla in the room. Oxcyon Centralpoint has over 200 modules. This means two things. The first is that Centralpoint is more or less a Swiss Army Knife for all of your content management needs. Meaning that if you have a problem, Centralpoint will most likely have a solution for it. The other thing this means is that because there are so many features, the solution can seem daunting and will be more complicated to use relative to other content management solutions. Overall, if you’re a smaller organization, you’d be better off looking for a different solution, but for mid-sized to large enterprises, Oxcyon Centralpoint will be an ideal solution.